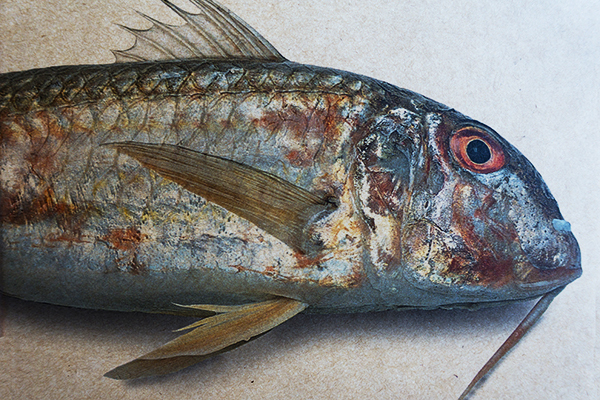 "'There is nothing,' you say, 'more beautiful than a dying surmullet [mullo]. In the very struggle of its failing breath of life, first a red, then a pale tint suffuses it, and its scales change hue, and between life and death there is a gradation of colour into subtle shades....See how the red becomes inflamed, more brilliant than any vermilion! Look at the veins which pulse along its sides! Look! You would think its belly were actual blood! What a bright kind of blue gleamed right under its brow! Now it is stretching out and going pale and is settling into a uniform hue.'" The red or barbed mullet (Mullus barbatus, from mulleus, "red") is a small bottom-feeding fish that, although mentioned by the Greeks, does not seem to have elicited any special enthusiasm. The famed gourmet Archestratus comments only on the best locales where it could be found (Athenaeus, VII.325D). In a letter to Atticus, Cicero speaks of wealthy Romans feeding by hand "the bearded mullet in their fish ponds" ( II.1.7). But, says Columella, the mullet is difficult to maintain there "since it is a very delicate kind of fish and most intolerant of captivity, and so only one or two out of many thousands can on rare occasions endure confinement" (VIII.17.7). A plentiful fish, Pliny relates that the red mullet, which was "distinguished by a double beard on the lower lip" (the barbels used to probe the ocean bottom for food), rarely exceeded two pounds, even when raised in fishponds (IX.64). By the first century AD, the Romans had become fascinated by larger specimens, for which increasingly extravagant prices were paid. Horace berates the foolish host who is taken with the appearance of a three-pound mullet but still must cut it up into single portions to serve his guests (Satires, II.2.33ff). And yet, says Martial, one that appears to weigh any less is disdained and should be thrown back (Satires, X.37)—and this when even a two-pound mullet was expensive (XI.49) and should weight at least that much to justify its place on a gold inlay dish (II.43, XIV.97). Marital goes on to satirize someone who sold a slave for twelve hundred sesterces, only to buy a four-pound mullet with the proceeds (X.31). The one put up for sale by Tiberius weighed four and a half pounds (Moral Epistles, XCV.42). And Juvenal speaks of an even larger mullet selling for six thousand sesterces, a thousand for every pound, more than for which the fisherman, himself, could have been bought (Satires, IV.15ff). During the reign of Caligula, Asinius Celer was said to have paid eight thousand sesterces for a red mullet (Pliny, IX.67); Macrobius says it was seven thousand (Saturnalia, III.16.9) and Tertullian, six thousand (De Pallio, V.6). When three mullets sold for thirty thousand sesterces, Suetonius records that Tiberius proposed regulating the prices charged in the fish market (Suetonius, XXXIV). Once in Capri, Tiberius had been startled by a fisherman who had clambered up the rocky ground to offer him a huge mullet. Alarmed, he had the man's face scoured with the fish. When, in the midst of this torment, "the man thanked his stars that he had not given the emperor an enormous crab that he had caught, Tiberius had his face torn with the crab also" (LX). But even mullets of more modest size were expensive, as Martial repeatedly implies. Certainly, it was beyond the purchase of someone with a moderate income and too expensive altogether if one were to marry (XI.37; VI.40). So precious was it indeed that a guest would wrap up half a mullet in a napkin to take home for dinner (II.37). Of the various kinds described by Pliny, it was the flavor of the red mullet, tasting like an oyster, that was most appreciated. The fish, he says, also was called the "shoe mullet" (IX.65) because its color (mulleus) was that of the mulleus calceus, the distinctive red shoe (calceus patricius) worn by patricians, which Isidore compares to the red scales of the fish (Origines, XIX.34.10). Tertullian has such a shoe worn by the madam of a Carthaginian brothel to comment on the inconsistency between what is worn and the character of the one who wears it (De Pallio, IV.10). Galen comments that the red mullet was "prized by men as superior to the rest in tastiness on eating" (De Alimentorum Facultatibus, III.26). But he does not understand "why very many people buy the largest red mullet, which has flesh that is neither tasty like the smaller ones, nor easily concocted since it is quite firm." Asking someone who had bought one, Galen was told that it was the particularly fine taste of the liver and head. Curiously, given its popularity in making garum, he declares the red mullet to be "bad for pickling, having flesh that is dry and without residue" (III.40). It was not the taste, therefore, that justified a craze for large red mullets, nor even its diverting change of color as the dying fish was brought to the dinner table in a glass jar to ensure its absolute freshness (Seneca, III.17.2; Pliny, IX.64; Martial, XIII.79). Rather, like the fragile myrrhine cups that might have accompanied such a meal (or, even more appropriately, the mania for tulip bulbs in seventeenth-century Holland), it was the display of extravagant luxury—of acquiring, as did the person who had outbid Apicius for the fish of Tiberius, "a greater reputation among his intimates." And, like all such ostentation, the fad eventually passed. By the late fourth century AD, the river perch seems to have become "the dainty of our tables...who alone canst vie on equal terms with the rosy mullet" (Ausonius, Moselle, 115-119). About the same time, Macrobius could say that the "ridiculous prices" offered by Celer were no longer being paid (III.16.9). This detail (right) is part of a mosaic found in the House of the Faun (Pompeii) and now in the National Archaeological Museum of Naples. 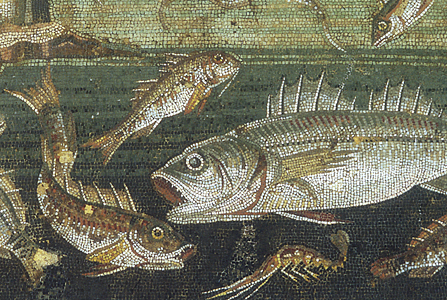 It is very similar to the more well-known marine mosaic found at the Villa Arianna and gives the same prominence to the large sea bass. Above it, though, one can see a smaller red mullet. The Greek name for the fish was triglê, which Athenaeus surmised might derive from the fact that the red mullet was said to spawn three times a year (quoting Aristotle, History of Animals, V.9, who goes on to recount that, when frightened, the mullet buries its head in the mud, thinking itself to be completely hidden, VIII.2), By analogy, the mullet was dedicated to Hecate, the goddess of crossroads who looks three ways (Athenaeus, VII.324D ff). Quintus Hortensius, who lost to Cicero in his defense of Verres, had fishponds at Baculo. But, to Varro's amusement, rather than eat from there, he always would send to nearby Puteoli for fish, feeding those in his pond with his own hands and actually taking "more pains to keep his mullets from getting hungry that I do to keep my mules." Indeed, Varro grouses, it would be easier to borrow his carriage mules and keep them than to take a barbed mullet from his fishpond (III.5ff). 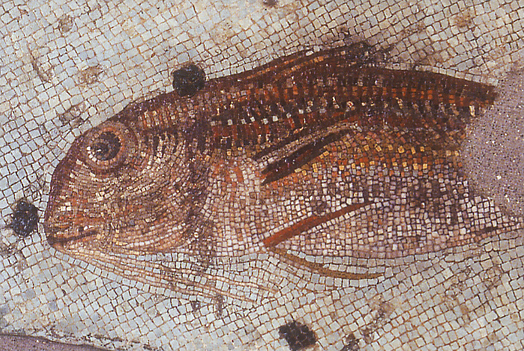 In this beautiful mosaic (left), the yellow stripes along the sides identify the fish as a striped red mullet, Mullus surmuletus, or surmullet, from the Old French sor, "reddish." One wonders, too, whether the three barbels at the chin mistakenly derive from the Greek name for the fish. Although the Romans made little distinction between the larger surmuletus and the smaller, more common barbatus, they were aware of differences in size and where the fish was caught. When Columella warns against the mullet being raised in fishponds, he likely is referring to the surmullet, a fish, says Martial, that is found only in deeper water (XIV.97). Pliny, too, implies that the best kinds are to be found in the open ocean (IX.64). In spite of Pliny's declaration that the mullet was plentiful, Juvenal complains that they have to come from Corsica or Sicily, "since our own sea [the Tyrrhenian] has been totally ransacked to the point of exhaustion, since gluttony rages, the delicatessens raking the nearest waters with nonstop nets—and we don't let the Tyrrhenian fish grow to size" (Satire, V.92ff). The fish also was venerated by those initiated into the Eleusian mysteries, "For surmullets are particularly good at killing and eating the sea-hare [sea slug], which is lethal to man. It is for this reason that surmullets possess this immunity, as being friendly and life-saving creatures" (Plutarch, De sollertia animalium, 983f). Although similar in appearance, there are differences between the two species. The barbatus tends to feed in deeper water on muddy bottoms and consequently has more sensitive barbels than the larger surmuletus, which feeds on sandy and rocky bottoms at shallower depths. The inner ear also differs or, in the phrasing of one article—"In teleost fishes the shape of the sensory macula of the otolithic endorgans varies, as does that of the otolith through ontogenetic development." The exquisite picture of a red mullet is from the menu at Giritli in Istanbul; the mosaics are from Antike Bildmosaiken. References: Seneca: Naturales Quaestiones (1971) translated by Thomas H. Corcoran (Loeb Classical Library); Lucius Junius Moderatus Columella: On Agriculture (1941-) translated by Harrison Boyd Ash and by E. S. Forster and Edward H. Heffner (Loeb Classical Library); Galen: On the Properties of Foodstuffs (2003) translated by Owen Powell; Plutarch's Moralia (1957) translated by Harold Cherniss and William C. Helmbold (Loeb Classcial Library); Marcus Porcius Cato: On Agriculture and Marcus Terentius Varro: On Agriculture (1934) translated by William Davis Hooper, revised by Harrison Boyd Ash (Loeb Classical Library); "The Roman Craze for Surmullets" (1948-1949) by Alfred C. Andrews, The Classical Weekly, 42, 186-188; Piscinae: Artificial Fishponds in Roman Italy (1997) by James Higginbotham; Antike Bildmosaiken (2003) by Bernard Andreae. See also garum and tulipmania.